Campaign season has officially begun! Want to start a new campaign? 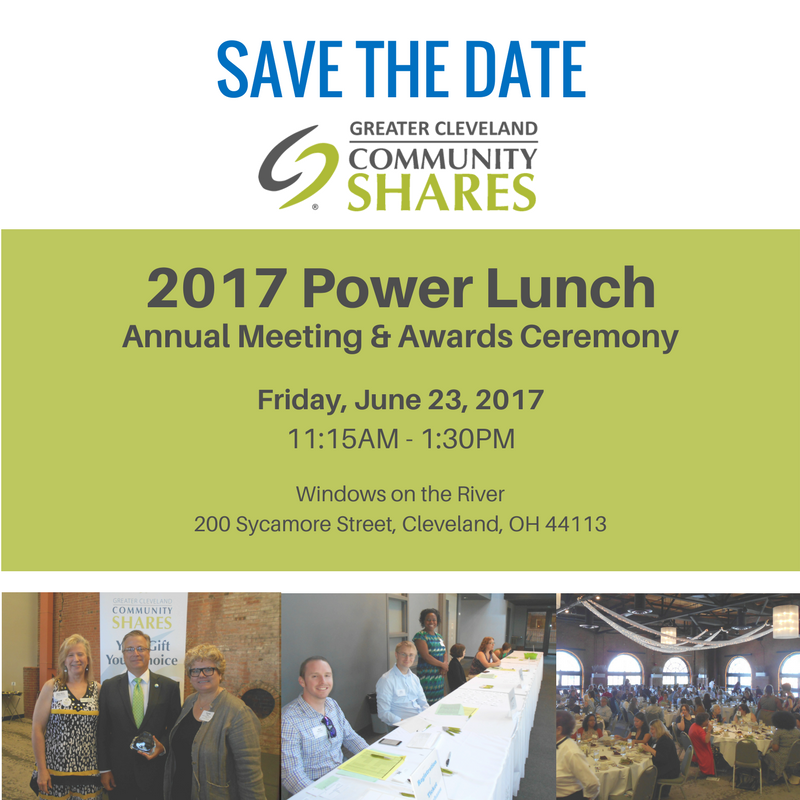 Contact Cynthia by email at cynthia@communityshares.org or call 216-361-9920. Click here to view the 2017-18 brochure. Already have a campaign? Need materials? Download files from our Campaign Toolkit. Our Executive Director, Cynthia Ries, was recently featured in a Cleveland 19 News (WOIO) story about an email scam targeting charities. Follow this link to see the clip: http://www.cleveland19.com/clip/12713321/scammer-targets-local-charities. 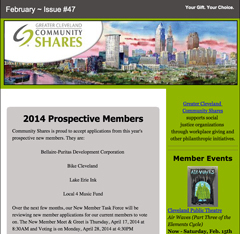 Our Executive Director, Cynthia Ries, was recently quoted in Crain’s Cleveland Business about philanthropy. Discounted Tickets to "The Cradle Will Rock"
CLEVELAND, OH…. 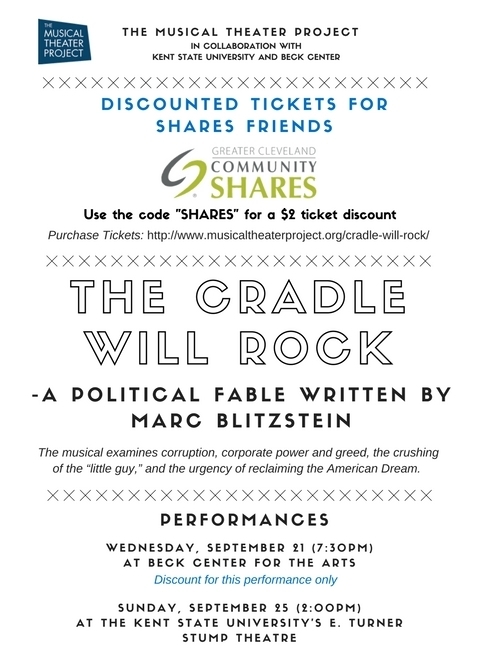 The Musical Theater Project, Kent State University and Beck Center for the Arts are partnering to produce in concert The Cradle Will Rock – a political fable written by Marc Blitzstein. Performances are Wednesday, September 21 (7:30pm) at Beck Center for the Arts, and Sunday, September 25 (2pm) at the Kent State University’s E. Turner Stump Theatre. Although first produced in 1937, the hard-hitting Cradle – funny, angry and stirring – was selected by the three organizations for its relevance in this tumultuous presidential election year. Blitzstein’s self-described “play in music,” a clarion call for unionism in an American steel town, remains the only Broadway musical the federal government ever tried to shut down prior to the Broadway opening night. Within its 80 minutes, we watch upstanding members of society – including the editor of the town’s newspaper, a leading doctor, a member of the clergy and two artists – sell out their principles to a ruthless corporate magnate. The musical examines corruption, corporate power and greed, the crushing of the “little guy,” and the urgency of reclaiming the American Dream. Featured performer Joe Monaghan, playing union organizer Larry Foreman, joins members of Kent State’s Music Theatre Program in reviving this American masterwork, directed by Terri Kent with music direction by TMTP’s associate artistic director, Nancy Maier. Each performance will begin with a brief multi-media presentation by TMTP artistic director Bill Rudman, joined by Kent and Maier. Beck Center is located at 17801 Detroit Ave in Lakewood. Tickets for this performance are priced at $27-$31 and can be purchased through TMTP’s box office at (216) 245-8687. KSU’s E. Turner Stump Theatre is located at 1325 Theatre Drive in Kent, Ohio. General tickets for the Kent State performance, are priced at $14-$18 and are available through the Kent State box office at (330) 672-2787. The Cradle Will Rock is presented as part of “The Song Is You!” concert season produced each year by The Musical Theater Project at a variety of locations. “The Song Is You!” receives additional support from Robert Conrad, Susan Kohn and Mike Kohn, the Cleveland Foundation, the Kulas Foundation, The George Gund Foundation, Cuyahoga Arts & Culture and Ohio Arts Council. Media sponsors include Cleveland.Com and WCLV 104.9 FM. ABOUT THE MUSICAL THEATER PROJECT—A nonprofit organization founded in 2000, TMTP produces concerts, in-school residency programs, radio programming and recordings that foster a deep understanding and appreciation of a uniquely American art form. To learn more about TMTP, call 216-860-1518 or visit www.MusicalTheaterProject.org. To schedule an interview with Bill Rudman, please call 216-529-9411 or e-mail info@musicaltheaterproject.org. Ohio Arts Council helps fund The Musical Theater Project with state tax dollars to encourage economic growth, educational excellence and cultural enrichment for all Ohioans. The Musical Theater Project also receives public support with local tax dollars from Cuyahoga Arts & Culture, to preserve and enrich our region's artistic and cultural heritage.